As plant names go, few can be as tautological as Erica ericoides. This name means the “heath that looks like a heath”; hardly the most enlightening of descriptions. The reason for this lack of imagination is because at one time the large Cape genus Erica was subdivided into many smaller genera based mainly upon the number of stamens and number of ovules in each flower. 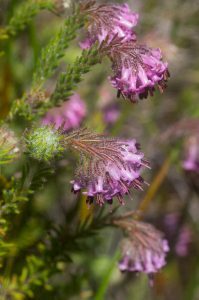 Erica ericoides was first formally described by Linnaeus but he included it in his genus Blaeria because it had four stamens and a single ovary (as opposed to his understanding of the genus Erica, which had eight stamens). As the understanding of the Cape Heaths developed, further genera were described, including several others that also had four stamens. Blaeria was retained as those species with 3 bracts at the base of the flower, four stamens and a 4-celled ovary with 2 or more ovules in each cell. Eventually, the genus contained about 16 species but as Erica taxonomy advanced, the experts realised that these were artificially grouped together. Often the relationship of one species was closer to a species outside the genus than to species within Blaeria. In 1993, Blaeria was absorbed by the ever increasing genus Erica. 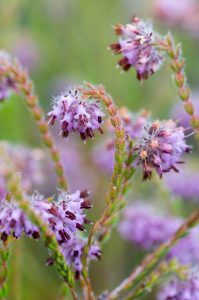 Though the name Erica ericoides may not be inspiring, the plants in bloom most definitely are. An individual plant is a low mounded shrub, covered with small pink tubular flowers, from which the four stamens and long style protrude. However, they often grow en masse, when they form carpets of pink along the drier lower slopes of the mountains. This is a beautiful sight, enhanced by the strong scent of honey that they give off and draws the attention of not just bees. On a still autumn day, the fragrance can fill the air, almost overpowering if you are walking amongst the bushes. 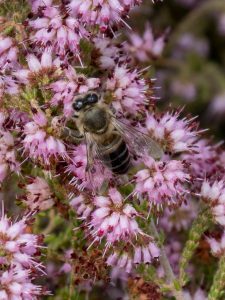 Furthermore, as the bees love it there is a constant buzz as they visit the flowers in search of nectar and pollen. So the display of Erica ericoides stimulates three senses at once (you can also touch the hairy stems if you want to but we don’t recommend tasting it – unless you can get hold of some fynbos honey). A single flower of Erica ericoides on the left, Erica russakiana in the middle, and Erica barberigeroides on the right. All taken at the same magnification. Observe the differences in the calyx and bracts, especially in relation to the corolla tube. 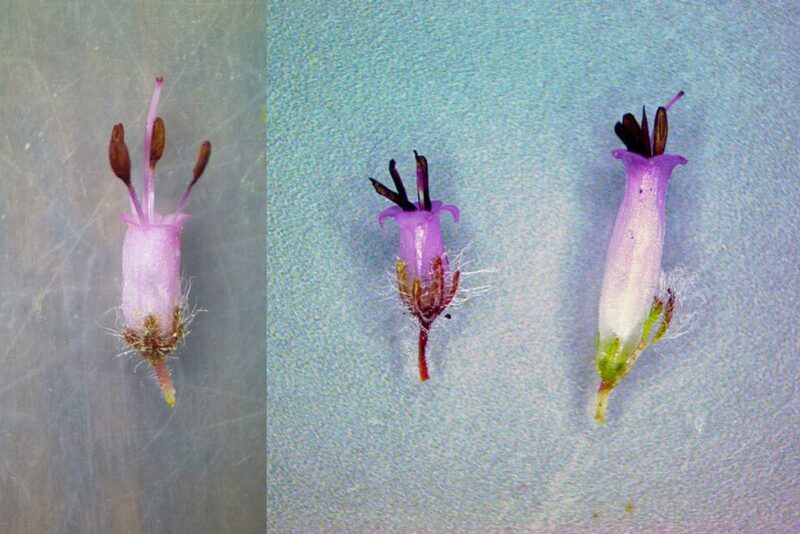 Erica barbigeroides has many more flowers in the head (12-24, as opposed to 6-16 in the other two species) and the flowers are the longest of the three (5-6mm long). The bracts of Erica barbigeroides are much longer than the sepals, about twice as long, and broader towards the apex (calyx and bracts about the same length and similar to each other in the other two species). It generally grows in damper areas than the other two species and flowers first in October to January. 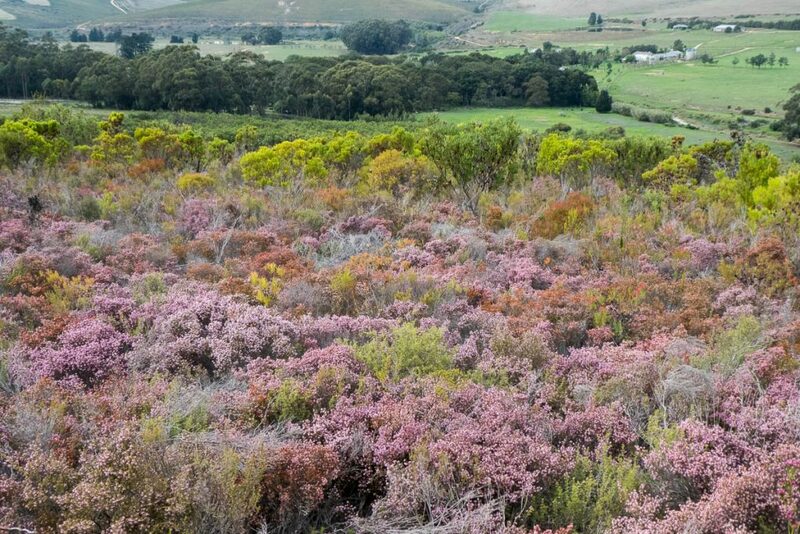 It is found from the Kogelberg to around Napier. 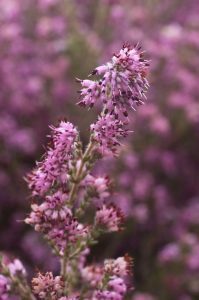 Erica ericoides grows in the driest areas of the three and can form large broad bushes about 50cm high and across. Its bracts and sepals are the shortest, about a third as long as the corolla and very similar to the sepals. The corolla is 3-4mm long. It is the latest flowering of the three, from February to April. The most widespread of the three species, it is found from Cape Peninsula to Bredasdorp and Gansbaai. Erica russakiana has fewer shorter flowers (± 3mm long) than Erica barbigeroides. Unlike the other two the anthers have distinct tails (Erica ericoides sometimes forms short ones). It forms a smaller bush than Erica ericoides, at most 30cm high, and has a longer calyx compared to the size of the flowers (over half the length). If flowers around December and January. It is the rarest of the three species, known from less than 10 localities found on the Klein River Mountains and Caledon Swartberg. April, autumn, bee-pollinated, Blaeria, Erica, Ericaceae, February, March. Bookmark.